Q: Can I visit your store to see the product before purchasing online? Yes. Click here for Store Locations. Q: How can I find out which store carries a specific item? Jackhan Sdn Bhd retail furniture stores are independently owned and operated. Please contact Customer Service at your local store. Click here for Store Locator for the exact locations. Q: Do you offer replacement parts? Using the item number from your email confirmation or from the packing list, key the item number into the search box. Once you are on the product detail page, the assembly instructions are there and you can print as needed. If the item(s) you purchased requires assembly, detailed instructions should have been included in the carton. Or you may email us at info@jackhan-intl.com for a copy; please include the following information: your name and your email address or mailing address and the item number(s) you need to assemble. You may also, call Customer Care at 267 0668/ 233 4130. Q: Does Jackhan Sdn Bhd make custom orders? With more than 6000 items in our product line, we offer one of the largest selections of home furnishings available. In order to maintain high quality products at affordable prices, we choose to produce our furniture in large quantities, realizing cost savings, rather than making custom orders. You may view our online catalog at http://brunei.intlhomestore.com/ or find the store nearest you. At this time, we are unable to support custom orders. However, some of our most popular items are offered in multiple sizes and colors to make it easy for you to find your style and your look. In our Living Room furniture selection, for example, you will see the same fabric available with different shape of sofas (traditional sofa, sectional or reclining sofa) and also, offered in different sizes but same fabric. Each leaf is cut when the table is made; therefore additional leaves are not available. Q: What are Durapella® & Duraplush™? Durapella® and Duraplush™ are high-tech fabrics that are a breakthrough in comfort. Durapella® and Duraplush™ consists of 100% MicroDenier polyester suede, which provides the subtle look and elegant feel of suede, yet improved durability and stain-resistance. Everyday spills like coffee, wine and ink are cleaned easily and effectively with a mixture of low PH balance liquid soap and water. DuraBlend® upholstery offers the rich look and feel of leather using a polyurethane/leather blend to create a comfortable and economical alternative to natural leather. Fabric Contents: 57% polyurethane, 26% poly/cotton, 17% leather. California King size is 4 inches longer and 4 inches narrower than King size. Q: Where can I find product dimensions? Every product has an area featuring applicable measurements for how the item will fit in a room, or if it's an accent, how it will fit atop a table, bookcase, etc. 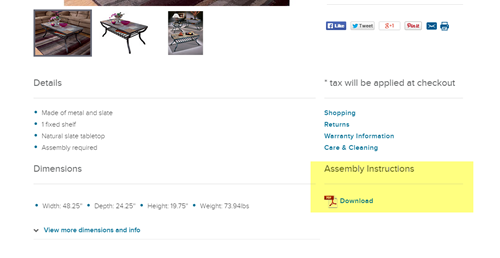 Some products have additional dimensions, located under the "Dimensions" section on the product page. For any upholstered furniture, the label with this number is attached to your furniture either under the removable seat cushion or underneath the unit/footrest. Q: How can I remove my name from your mailing list? Please email us at ashleyhomestorebrunei@gmail.com and include the full name and email address you want to have removed. Q: How can I unsubscribe from your email list? Just click “Unsubscribe” located at the bottom of the email. Q: How can I get a Jackhan Sdn Bhd catalog? Many Jackhan Sdn Bhd carry the most up-to-date catalog. In addition, you can view the catalog online. Q: Can I buy factory direct? Not at this time. But good news: many products are available for purchase online. Click the Shop Now section on our home page to begin shopping. Our products may be also be purchased from Jackhan Sdn Bhd retail stores throughout the country. Click for the Store Locator.